Baker-Smemoe, Dewey, Brown, and Martinsen’s article “Does Measuring L2 Utterance Fluency Equal Measuring Overall L2 Proficiency? Evidence From Five Languages” in Foreign Language Annals 47-7 (Winter 2014), 707-728 reports on a study done in five languages. They measured elements of fluency using excerpts from ACTFL Oral Proficiency Interviews (OPI) spoken by 86 participants. Forty participants provided pre- and post OPI speech samples. All the participants were native English speakers who spoke other languages. – L2 fluency of the number of hesitations and false starts varies not by level nor language but by the individual speaker. – Fluency varies by language. Reaching L2 proficiency level in German takes longer than reaching the same L2 level in French for native English speakers. – Incrememental improvements in L2 proficiency did occurr with concomitant changes in L2 utterance fluency for two of the measures (faster speech rate and longer run length). These two measures also predicted L2 proficiency in general. If speech rate and longer run length help predict proficiency, how do you help you students develop these in their world language communication in your class? http://bit.ly/mlcomcult has many fluency activities with fluency boxes for students to record how many sentences they say in a specific time. Go to top menu – More. Each student speaks in pairs so that everyone in the class can increase their amount of speaking. Each student responds without looking at their notes, the handout, the textbook, the classwebsite, or the PowerPoint. They speak spontaneously. Each student answers real situational or topical questions, not questions designed to illict a specific grammar point. Each student answers many questions for the same topic so they go in-depth with a topic. Each student answers many different questions. Often in class, students only get called on a few times. Each student who answers a question or makes a response can receive formative feedback from the partner who can see a sample answer. Each student has low emotional stress since the student is asked a question by another student and not the teacher. At the same time, often partners compete against each other to see who can answer the most questions or say the most sentences. Each student can use the scaffolding of the asked question, the visual, etc. to help become successful in responding. Modern Language Communication and Culture contains over 40+ communication activities that are ready to use for the classroom. To help you to find an appropriate activity, the activities have been subdivided into Modern Language (visual stories for all languages), Spanish, Can-Do, Groupings, Topics, Culture and Grammar. Which of your activities are highly effective world language communication activities? – Does digital badge physically represent the standard/ proficiency? – Does the digital badge title accurately represent the standard/ proficiency? – Do you give a digital badge for each standard/ proficiency or do you group standards together. 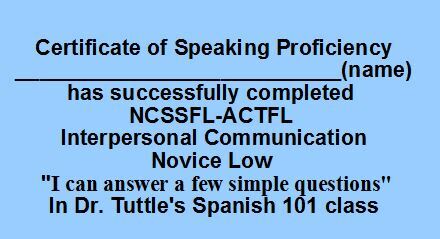 Example in World Languages, there are 57 Can-Do proficiencies,does each get its own badge? – Are the digital badges arranged to show progress through the standards/ proficiencies? At http://bit.ly/tpthtuttle, I have 5 any language picture speaking activities and 25+ ready-to-use Spanish structured speaking activities for beginning students (including 5 Can-Do ones). At http://bit.ly/tsmash, I have an ebook. Modern Language Proficiencies-Can-Do with many activities. At http://bit.ly/tsmash, I have an ebook 90 Mobile Learning Modern Language Activities (mainly speaking and many current culture activities) and a English Common Core Mobile Activities At http://bit.ly/tuttlebks, I have a book, Improving Foreign Language Speaking Through Formative Assessment. At http://bit.ly/tpthtuttle, I have numerous students-as-investigators cultural activities (modern language culture). “My father and mother are separated” is both hands in fists with the knuckles touching, lift up the thumbs and quickly spread the hands apart ; students understand “separated” instantly. Likewise, as a teacher tells a story and comes upon a new word, the teacher gestures the meaning of the world. Additionally, as students talk in the language, they may not remember a world and the teacher can do the gesture to help them remember the word. Gestures can help clarify grammar such as when the teacher does a flip of the hair to indicate a feminine ending after the student uses an incorrect masculine ending. Gestures help the class stay in the target language. 1) Create his/ her own gestures to convey the meaning of words or sentences. 4) Use ASL (American Sign Language) signs such as from the Signing Savvy webiste. How do you use gestures to help your students have more comprehensible input in the class? Students are in a world language class for forty minutes five times a week or 40 minutes x 5 days = 200 minutes; 200 minutes/ 60 minutes in an hour = 3.33 hours a school week. These fantastic forty minutes are the only time that the world language students can listen to their teachers speak the target language and react to the teachers and the only time the students can communicate in the target language and have other students react. During a five day school week of 120 hours (5 day x 24 hours), the students spend only 2.75% of their time in world language class. That extremely small number means that world language teachers have to maximize communication time in the classroom. How much target language do your students hear during the Fantastic 40? How much target language do your students speak during the Fantastic 40? Could someone mistake your modern language class for an English class due to the large amount of English being spoken? When world language teachers move from translation activities to communication activities, they move closer to the language goal of producing students who can communicate. Instead of having students play a translation game (one students holds up a card with English on one side and Spanish on the other while the partner says the Spanish for the English), students can say basic sentences. For colors, the students can say the colors of the objects in the class such as “The door is brown.” or they can change it into a question activity such as “The door is brown, right?” or “Is the door brown?” The teacher provides the sentence structure and then the students create the sentences that their partner answers/responds to. The students use the colors to describe or ask about their class; they communicate basic information. They use the colors for communication instead of for translation games. How much world language do you use during the Fantastic 40 in you class? How much do the students use? Do they use words for communication instead of translation? At http://bit.ly/tpthtuttle, I have 5 any language picture speaking activities; 25+ ready-to-use Spanish structured speaking activities (including 5 Can-Do ones) for beginning students; and numerous Spanish students-as-investigators cultural activities. At http://bit.ly/tuttlebks, I have the book, Improving Foreign Language Speaking Through Formative Assessment. self -> family / friends -> community / city. Most of the Novice level focuses on socializing. In this approach students go from what is most known or familiar to them (themselves) outward (to others). Most modern day textbook follow this approach. This approach assumes that students in the classroom will be talking in the target language to other students about things in their lives. Another approach is the travel approach where students learn a language to survive in the target language country. This approach concentrates on daily functioning in the language country. Students learn how to order a meal, ask for a hotel room, check on the price of a product, etc. Very old textbooks and travel conversation books follow this pattern. The travel approach assumes that students in the target language country will be talking in the target language to native speakers. Although students enjoy talking in the target language to each other and learning about each other as in the ACTFL approach, I have found that they feel the geatest sense of achievement when they can do a real-life daily survival task in the language such as “I can ask the price of something.” I try to blend the two approaches. As soon as my students learn the numbers (1-59) in the first unit , I teach them to go from telling time to asking the price of things such as “How much does this soccer ticket cost?” Since I use cultural products in class such as a soccer ticket, the students practice asking and answering how much real things cost. In the ACTFL approach, students cannot ask the price of something until the end of Novice Mid, very near the end of the course. What approach do you use with your students? What survival skills do your students have even in the beginning level? At http://bit.ly/tpthtuttle, I have 5 any language picture speaking activities, 25+ ready-to-use Spanish structured speaking activities (including 5 Can-Do ones) for beginning students and numerous Spanish investigation cultural activities.